Previously one of the most common forms of financing a vehicle was through Hire Purchase (HP). It has decreased in popularity in recent years in favour of Personal Contract Purchase (PCP) and Personal Contract Hire (PCH). Here’s all you need to know on HP to decide if it’s the right car finance option for you. With HP you reach an agreement with the dealer to pay an initial deposit, typically anything between 10% and 50%, and then pay off the balance in monthly instalments over an agreed period of time. At the end of this period, the car is yours. 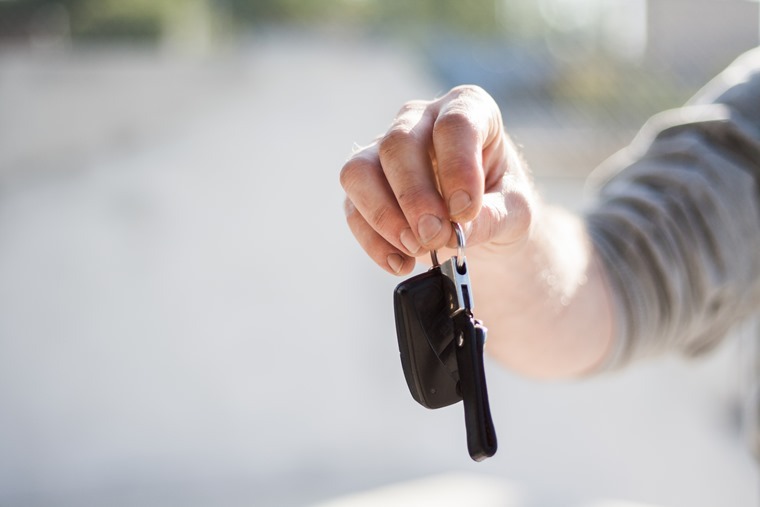 Unlike a lease or a Personal Contract Purchase (PCP) agreement, the residual value of the vehicle is not taken into account. Instead your monthly payments on a HP agreement are determined by the retail price of the vehicle, the size of the deposit, the length of the contract and any interest payments. In effect, the contract is between you and the lender (usually a bank or broker) but is normally arranged by the dealer. The lender effectively buys the vehicle and allows you to use it while you make payments. Only when all payments are complete is the car officially yours. What are the pros and cons of Hire Purchase? The main advantage of a hire purchase agreement is that you can buy something you couldn’t otherwise afford. Your monthly payments are effectively secured against your car – and this has both pros and cons. Positively, this means you’re more likely to secure finance than you would be by shopping around for an unsecured loan as the lender has some ‘security’ in the form of your car – this is often reflected in better interest rates. On the downside however, you must be sure you can keep up with payments or the lender will have the right to repossess the vehicle. Normally this will apply if you’ve paid less than a third of the agreement – if you’ve paid more than that it is usually necessary for the bank to take you to court to either reclaim the vehicle or the remaining cash. For most however, this is a safer form of finance than a regular secured loan – which puts your house at jeopardy if you can’t meet repayments. Interest rates can be high – they are usually determined by your credit rating. It’s also worth remembering that it’s not necessarily in the dealers interest to get you the best deal – they will encourage you to take hire purchase agreements so they can earn commission from the lender. Their objective is often to sell you money at the highest possible rate – so ask questions and be prepared to look around to other lenders for a better rate of interest. It’s important to check out the APR to determine what the real cost of borrowing will be. Monthly payments will usually be higher than other forms of car finance, but in the long run the overall sum will usually be lower. Reselling the vehicle during the hire purchase term can be complicated. You will still need to pay off the money you owe in full. Also watch out for early settlement fees and purchase fees. These are not mandatory on hire purchase agreements but will be charged by some dealers. What does a HP deal look like? 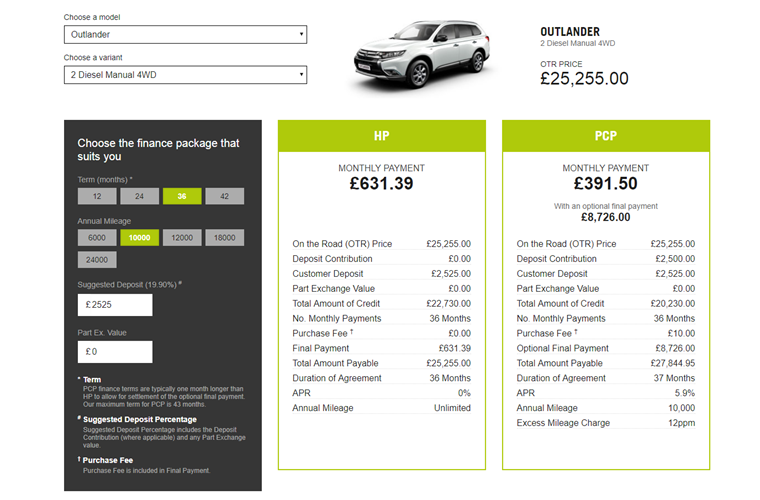 Below is an indicative quotation for a HP and PCP deal from Mitsubishi on an Outlander for 36 months on 10,000 annual mileage with a 10% deposit (August 2017, for illustration purposes only). Is HP right for me? HP is the traditional form of car finance and is a good way of paying for a car that you know you want to own at the end of the agreement and don’t mind paying extra per month to work towards ownership. However, getting a good HP agreement can be difficult so you must be savvy. Don’t just accept the offers that the dealers present to you. Be prepared to ask questions and if necessary, shop around. Remember, the lower the APR, the lower the cash you will have to pay back in the long run. Work out the total amount you will have to repay and always read the small print. What is car depreciation and why is it important?